As I became some 5 years old, I started equipping myself with armors and shields against those untimely, unsolicited intruders called family guests. A typical visitor, after spotting me in the household, would summon me and begin with the volley of his questions. “What is your name”, typical first question. If I simply answer as “Sandeep”, there used to be question 1b ready… “Tell the full name”. The typical Marathi full-name is in “name – father’s-name – surname” format, which I would appropriately answer. Thus after clearing the qualification round, the next variations would be played. Some would ask me sums, some would ask who’s-who in Ramayan-Mahabharat… but most would ask either “Who is the PM of India” or “Who is the CM of Maharashtra”. I would beamingly reply “Indira Gandhi” or “Sharad Pawar”, leaving the guest happy. I guess in my case those questions were not mere questions, they were also related to the political leniency of the questioner. My family, relatives, family-friends and in general the region were ardent supporter of Congress. Thus my answers to the PM/CM question were somehow pleasant to them. I was given to understand that Indira Gandhi and Sharad Pawar were two of the greatest people to have walked on this earth. In 1984, when Indira ji was assassinated, I can remember the gloominess that descended upon. The smiling, ever talkative elders around me were suddenly heavy, mute. Nobody was willing to play with me or answer back, although I had done nothing mischievous. Since Television wasn’t common in those days, some people had kept their TV set in their balconies facing the street and the crowd was standing in the street to see the last rites of their dear PM… unusually silent and motionless for a street crowd. That was the first impression of the first prime minister I had ever known! Then came her son on the throne and I was given to understand by the ever faithful loyals around me that he is also quite good a PM. But in next 5 years as I grew older, he was primarily reduced to an object of mimicry for us school-children with frequent “hamein denkhana hain….”, “hamein karna hain…” type dialogues. Though I was told that he is very good PM, he could not make it second time. Then came one Mr. V. P. Singh. The first interesting thing about him was his fur-cap and the associated animal-rights issues picked by his colleague, one Mrs. Maneka Gandhi. The second fun part for the children was his name itself! We used to enjoy gesturing his name with fingers as V (as in Victory), P (drinking gesture. Thankfully, our English wasn’t so advanced in those days) and Singh (as in horns). Mr. Singh did not last long and so did his successor Chandrashekhar. This was followed by the shocking assassination of Rajiv Gandhi leaving everyone shocked and saddened. P. V. Narasimha Rao the great, became the next PM. This was perhaps the best thing to happen to India in that period of disappointment. But I doubt if many realized his value at that time. Rather his tenure was marred with scams and controversies. I although remember at the end of his 5 years the Congress started broadcasting an Ad on Doordarshan about key achievements of his government. It was sensible, informative and less propagandist Ad, which a school kid like me too could understand and appreciate. Then there were H D Deve gowda and I K Gujral. The former was known for his dozes and the latter for his flamboyance. The lesser said the better. Soon the next elections were announced. By now I had stopped taking PM post seriously…and then something unthinkable happened. My grandmother, who was always an ardent Congress-Nehru-Indira-Pawar fan since the pre-independence times said something unthinkable, unimaginable to me. She said “Vajpayee deserves a chance now”. I had never dreamed that I would ever hear name of a non-Congress player from such a staunch Congress supporter!!! That certainly made me curious about Shri. Atal Bihari Vajpayee. He really got what he deserved in the next elections. He took the oath as Prime Minister. But by now my opinion about being PM had become similar to being Miss World or Miss Universe. You are only interested in the contest, nobody really cares what the Beauty Queens really do after winning the title! Thus I was not much keen on what (and if) Mr. PM does after assuming his office. My indifference did not last long. Sooner than one could imagine, India performed nuclear tests… and thereafter things went on happening… one after another… one way or another. My apathy turned into curiosity, curiosity into interest, interest into admiration and admiration to fan following! Soon I found that I was not only one to experience this, many friends and acquaintances of my age group had turned into ABV admirers /fans. 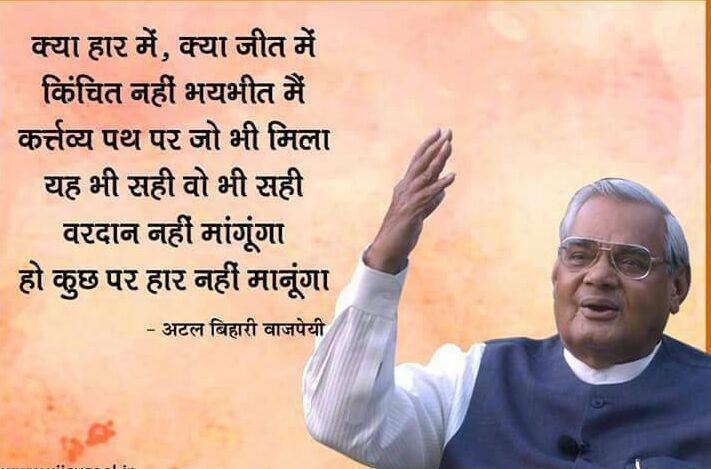 These fans now certainly have a reason to rejoice when Atal ji has got Bharat-ratna. Today at this juncture when it’s been 10 years since Atal ji had stepped down from Prime ministership and retired from public life, I reflect upon how he stood distinguished from his predecessors, how he brought back grace and dignity to the post of PM, how he transformed indifferent, disinterested youth of his times (like me) into a more keen and aware one. I am trying to list his achievements not against any political backdrop, but instead from my perspective… perspective of a commoner whose whole political awareness was mere 15 min reading of daily newspaper. 1. The “happening” government – The first thing that would tell ABV government from its predecessors. We all like to live in happening places, that applies to the government as well. Under ABV government I saw for the first time that so many things can happen together…the decisions, reforms, policies, initiatives, infrastructure development. I for first time realized what a powerful machinery a government can be when it decides to wake up. 2. It’s not about subsidization, it’s about promotion – From the times of PVN Rao, there was murmur of Indians making mark abroad. By the time ABV government took up, the IT industry was gaining momentum. To promote the Software literacy, the government decided to exempt laptops from the import duty. As an immediate result, I started seeing every colleague/friend of mine who went on a foreign trip returned with a laptop – either for himself or for someone else. This is fifteen years ago, when the imported goods carried much importance than they do today. I haven’t seen many government decisions that so quickly and effectively trickle down to its’ subjects. 3. ABV, the rare combination of a leader, an administrator and a diplomat – Vajpayee ji had charisma of Nehru and command on his organization like Patel did… a rare combination. The charismatic leaders have little bit of romanticism around them, that makes them difficult to take tough, pragmatic decisions. The no-nonsense administrators on the other hand do not hesitate taking unpleasant decisions, without caring about their own appeal or image. These practical restrictions normally give rise to paired leaderships, like Nehru-Patel, Sachin-Ganguly or Rajinikanth-Kamal Hassan. Vajpayee ji was a rare case which combined both qualities. He had his appeal and charisma on one hand as well great administrative command – the cabinet, coalition, bureaucracy etc in ABV govt had distinct Vajpayee impact. 4. A different charisma altogether – Prior to Vajpayee ji, the only Prime Ministers who had charismatic persona were Pandit Nehru and Indira Gandhi. But there is a fundamental difference. The charisma of Pandit ji stems from his wealthy family background, Cambridge education and handsome personality. Same can be said about Indira ji. They both looked a class above the commoners, they looked like the ‘rulers’. This is where appeal of Atal ji differs, his personality is that of ‘grandpa next door’. The qualities for which he is revered by common people – his eloquence, his articulations, his poetry – are otherwise things of daily encounter which he exhibited masterfully. So ABV never looked like a ruler, he always looked like leader. Taking this point further, I think when people see someone of their own flock doing spectacular things, they love it even more. The same Atal Bihari Vajpayee clad in dhoti-kurta moves among his people in most homely fashion and with the same effortlessness he walks on international platforms like UN to address nations. This makes his people embrace their leader with much more fond, affection and pride. They can very strongly identify themselves with their leader. Their leaders gestures are their own gestures, and consequently their leaders achievements are their own achievements (at least symbolically). For leaders the story doesn’t end at making achievements, but it is more important that their own activities become the source of inspiration to their followers. One never knows in which form this inspiration would come or how and where it would manifest itself. It is sufficient to say that, a couple of years ago when people were fed up with inaction and corruption of UPA government and the compromised media, many individuals took matters in their own hands and waged their tiny little war on social media… together it emerged as a strong force that changed all equations in politics. Behind nearly every voice that was raised was this inspiration of Atal Bihari Vajpayee and his exemplary governance that existed10 years ago! Today when Atal ji turns 90 and receives the highest civilian award “Bharat-Ratna” – which I feel is partly award and partly gratitude – I do not know whether to be thankful to God or to feel unfortunate on account of his ailing health and seclusion in past 10 years. May God grant him best of health! Eager to see some addition in this PM list with MMS & Namo..
About ‘flamboyance’ – being flamboyant is not bad as such. Even Nehru was flamboyant, or to use a milder word – man of taste. If you have served your nation well, flamboyance or other things don’t matter.